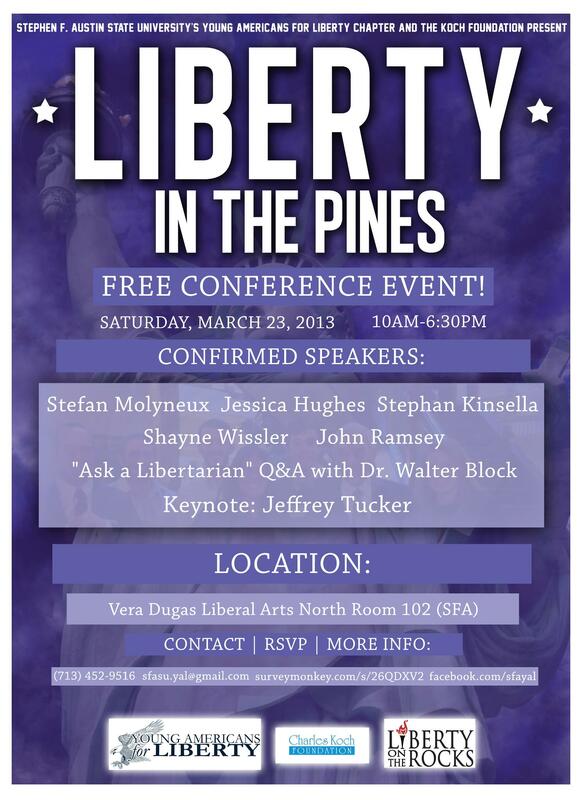 Stephen F. Austin State University‘s Young Americans for Liberty chapter and the Charles Koch Foundation will be hosting a conference called “Liberty in the Pines” (facebook event) later this month at Stephen F. Austin University in Nacogdoches, Texas (about 2 hours N of Houston). I will be speaking on “Locke’s Big Mistake: How the Labor Theory of Property Ruined Economics and Political Theory.” Stefan Molyneux will also be speaking, and Jeff Tucker will deliver the keynote. Walter Block will conduct an “Ask a Libertarian” Q&A session (remotely), and other speakers will appear as well. I’m looking forward to it. Please include me in your list of participants for the March 23, 2013 free conference at Stephen F. Austin State University. Also, please advise if there is an official registration procedure that I need to complete. This will be my first time to attend such an event as I am recently learning about libertarianism. Please direct me to a website or other resource that you believe would give me appropriate, early background knowledge before the conference. see the facebook event page: http://www.facebook.com/events/131808246986727/?fref=ts — you can ask questions there. See also the links I posted above which provide some background for my own talk. Previous post: Who is a libertarian?